Saint Patrick - My Catholic Life! 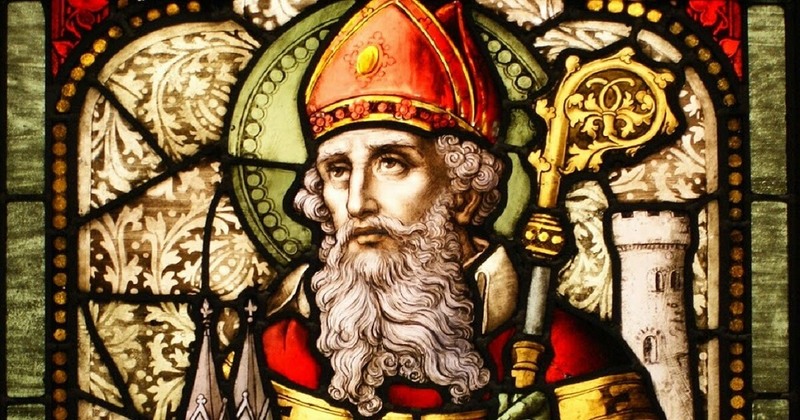 Today’s saint, the Patron of Ireland, was English. He was born in an unknown year to Catholic parents in an educated home in Roman Britain. His father was a deacon and his grandfather a married priest. When he first went to Ireland, he did not go willingly. He was kidnapped by pirates at the age of sixteen and enslaved. He went from the warm embrace of his home to herding pigs, exposed to sleet and cold, starving on the rain-soaked coast of rural Ireland. Times of great danger and deprivation are often times of great grace. In young Patrick’s years of isolation, cold, hunger, and loss, prayer was his only nourishment and comfort. His captivity turned a boy into a man and transformed a tepid Christian into an ardent soul burning with love for the Holy Trinity. After six years of torturous enslavement, Patrick escaped his captors and made the difficult voyage back to his own nation, family, and language. But the Irish were never far from his mind. One night, he had a dream. Patrick sees a man he knew in Ireland named Victoricus approaching from the west. Victoricus holds countless letters and hands one to Patrick. It is titled “The Voice of the Irish.” As he begins to read the letter, Patrick hears a multitude of voices rising, as if one, from a forest near the Western Sea: “We beg you, holy youth, to come and walk among us once more.” Patrick is deeply moved. Unable to read any more, he wakes up. Patrick decides to be a slave of Christ and to return as a missionary to Ireland. Feeling himself unprepared, he first studies for many years at monasteries in France. After receiving an excellent education in the Faith, he receives priestly and episcopal ordination. He then embarks as a fully equipped missionary for his adopted homeland. There he finds a rustic people steeped in paganism. It is not today’s paganism—well read, superior, and too sophisticated to believe in religious “mythology.” Real paganism, the paganism of remote Ireland, called upon dark forces to conquer the white spirits and angels of God. Real paganism casts spells, calls down lightning from the night sky, mixes potions to poison its enemies, and forms flames into swords for battle. Real paganism invokes the devil because it knows satan keeps his appointments. This is the dark paganism Patrick finds lurking in the foggy hills and bogs of his new land. Fifth-century Ireland had a deeply entrenched, richly layered culture of pagan worship. And Bishop Patrick used his crozier, like a dagger, to stab it right in the heart. Saint Patrick converts the Irish, one tribe after another. He matches the tribes’ preternatural forces with supernatural powers. There are numerous anecdotes, of dubious historicity, describing how Patrick turned an enemy into a fox, converted his walking staff into a tree, or drove all the snakes out of Ireland. These tales illustrate a deeper point—Saint Patrick had command over creation itself and used that power to communicate the truth of the Christian God who created creation. There is no doubt that Saint Patrick harvested an immense number of souls. For the Church to send a bishop to Ireland in the fifth century was to land a man on the moon. Beyond Ireland there was no one and nothing. Patrick evangelized a rugged, clever people in a rugged, clever way. He conquered their witches, wizards, and warlocks with the Holy Spirit. He vanquished their incantations, potions, brews, demons, and sorcery with the Body and Blood, Soul and Divinity of the Son of God in the Mystery of the Altar we call the Blessed Sacrament. He overcame the “black laws of pagandom” with a protecting God who walks always and lovingly at our side. Many centuries of saints, abbots, missionaries, scholars, and monks set sail from tiny Ireland to traverse the globe in service of the Gospel. 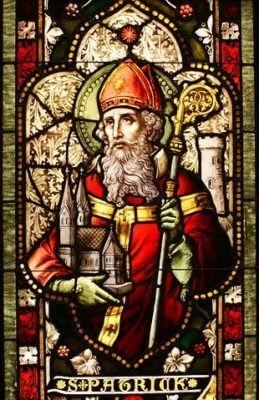 They owe the rich Catholic culture of their homeland to that mighty pillar of faith known as Saint Patrick. Saint Patrick, Apostle of Ireland, assist us through your intercession to trust in the raw power of God to conquer evil. Give us confidence to confront evil spirits, however they may show themselves, so that the peace of true religion may reign where it does not reign now.